Grey seals in Wales give birth around September-October. A good place to see the conspicuous white pups is Cardigan Island Coastal Farm Park which has enough attractions to satisfy all members of a nature-loving family. As well as seals, there’s a good chance to spot Bottle-nosed Dolphins, resident in Cardigan Bay. Birdwatchers can observe Peregrine Falcons or Red-billed Choughs. For young visitors (or not so young) there are friendly farm animals, including Dilwyn the Donkey. Hafod Eryri, Snowdon new visitor’s centre is the highest building and highest café in Britain (see Slideshow). The Guardian’s architecture critic, Jonathan Glanceyn describes it here as a ‘complete surprise’ and “a feat of ‘engineering sorcery’… fits so effortlessly into that peak is a real credit to those who designed and built it.” On arrival, visitors are greeted by lines of poetry carved into the outside walls of building, by Welsh poet Gwyn Thomas. The building must be able to withstand extreme weather conditions on the summit (Winds over 150mph -twice hurricane force-, over 5 metres of rain a year, temperatures of -20°C -excluding wind chill). Well worth either the climb or taking Britain’s only rack-and-pinion mountain railway train. The Monmouthshire and Brecon Canal threads through some of the most beautiful scenery in South Wales. With it’s industrial life is over, it offers the opportunity to see the Welsh countryside from your very own self-drive diseal or electric narrow boat. The canal covers 33 navigable miles from Brecon to Pontypool. Average cruising speed is 2-3 miles per hour so you will need at least a week to enjoy the canal. 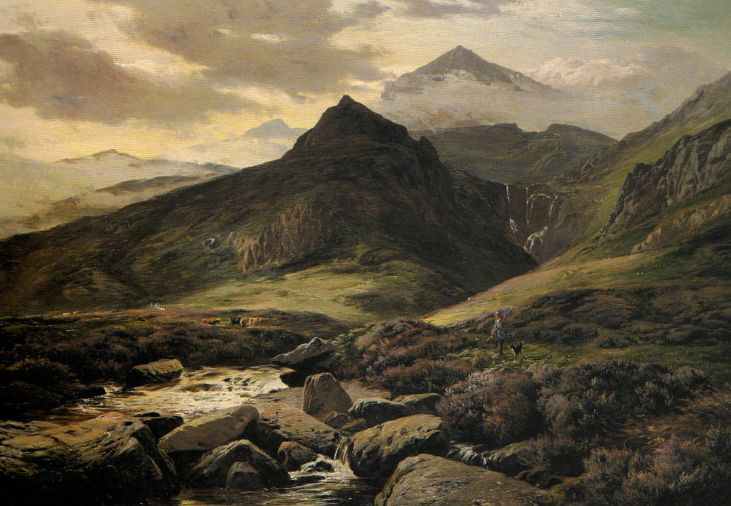 Sidney Richard Percy (1821 – 1886) is one of my favourite 19th century landscape painters. He had a particular love of the Welsh landscape of Snowdonia and the Merioneth region around the village of Llanbedr. These peaks shrouded in clouds draw me in and make me want to climb them.